The discerning artist must ask herself—What is art, and why is it important? While the answers to these questions may initially appear subjective, when I step outside myself, the elusive, yet universal truth is revealed. For a time, I am both the artist and the viewer. See my focused eyes, my brush tipped with paint. Each stroke is a moment captured in time, each color a reflection of my mood, the finished work a fragment of my essence skillfully rendered upon the canvas, and at last, and forever, the human condition is immortalized anew. Laura Ficarra was born and raised in New York by Italian immigrants. Early in life she was exposed to art and culture both in New York and Italy. She always admired the masters and still looks at their work with awe and inspiration. 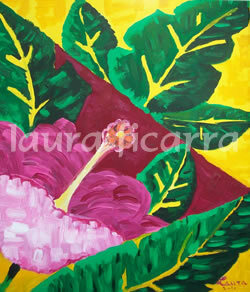 Although, she has been exploring all genres and mediums, her true passion lies within her abstract acrylic paintings. Her favorite artists include but are not limited to Vincent Van Gogh, Claude Monet, Willem de Kooning, Mark Rothko and Barnett Newman. Exploration of color wrapped within creative construction of collages combined with medium and paint. Creations from within varying according to emotions, an expression of the soul." 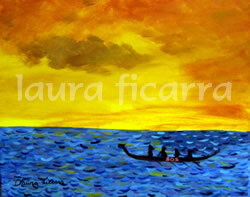 This original painting was created for SOS, Save our Sisters, Breast Cancer Survivors Dragon Boat racing team. More information about them can be found at http://www.teamsosmiami.com. Part of all proceeds go towards their team and cause, so please help support them. 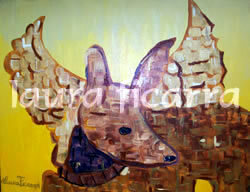 A US postal stamp with this painting is also available. Don't forget to let us know where you heard about Laura. All images on this website are original artworks property of the artist and may not be reproduced or be used externally without permission. Please send an email for more information. Detail of painting based on a work of Renoir. View more paintings in the Nature Gallery.